The wireless IoT market is crying for small mobile devices transmitting for years from tiny batteries. With akorIoT Nano we developed the next open design. “akor” is the Proto-Celtic word for “open”. 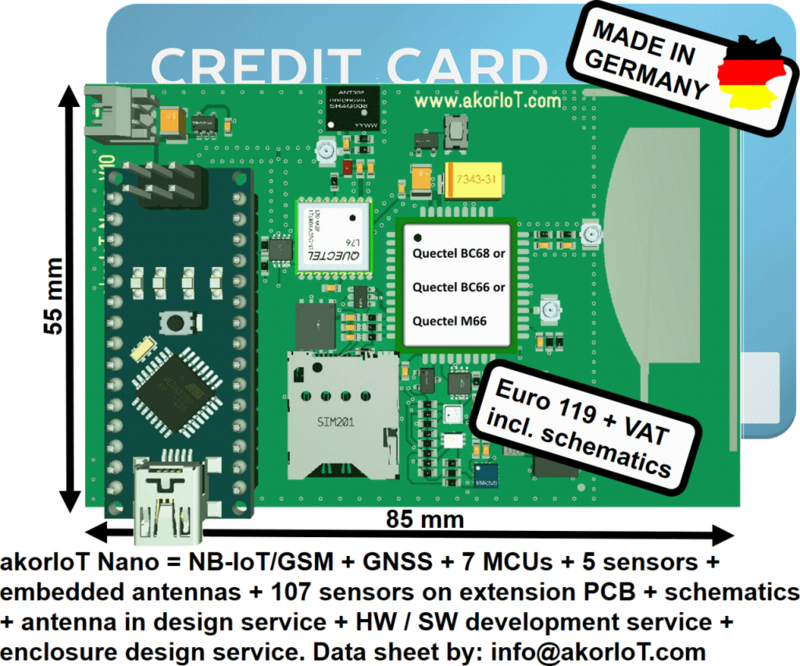 With placing the order for akorIoT Nano you get the schematic diagrams, some demo code for a unique PCB with NB-IoT-, GSM-, GNSS module in credit card size (85 mm x 55 mm), five sensors, including the embedded cellular antenna. 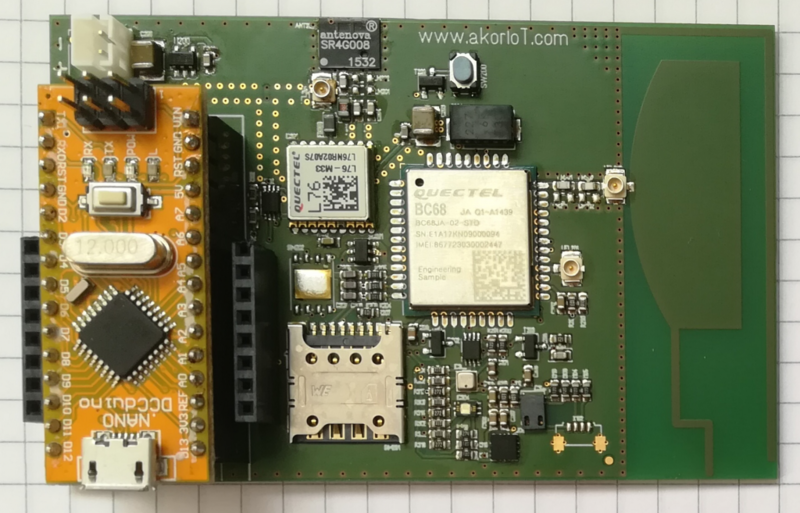 The akorIoT team offers not just a plain piece of wireless IoT hardware. You have the freedom to ask for antenna matching of any kind of antenna bought by any party up to placing an order for your own customised antenna. One reason for an own antenna will be maybe cost reduction. Another reason is that rectangle chip antennas does not fit in “round corners”. The akorIoT team is able to develop antennas in different shapes up to copper structures sprayed inside of the plastic enclosure. Description Compatible with the Arduino software development environment. In addition to Arduino hardware and software compatibility the akorIoT Nano is compatible to any C Complier compatible supported by ST Microelectronics Nucleo. Extension connector for sensors Extension to 107 further sensors ( e.g. temperature, air pressure, humidity, visible light, infrared light, hall (magnetic), gas (NOx, alcohol, LPG, methane, carbon monoxide, hydrogen, Volatile Organic Compounds), smoke, fine dust, accelerometer, motion, gyro, compass, proximity, vibration, spectral intensity, EMC/EMG, heart rate, stretch force, lightning, earthquake, water leakage, soil moisture and a lot of more. Has this article piqued your interest? Do you plan to deploy IoT devices with embedded antennas? Do you have an IoT prototype and need to optimise the design or minimise the price? If you have answered YES to any one of these questions then please do not hesitate to drop an email to harald.naumann (at) lte-modem.com and to ask for a proposal or some engineering services to make your IoT idea a cost-effective reality. do you have more infomaterial how the Extension to bridge to LoRa and BLE for the akorIoT Nano looks like and what is the Price for? I would need a modul with NB-IOT, Lora and BLE in it and another modul with NB-IOT and BLE – can you offer such a moduls? Dear Mr. Geider, yes I do but it is to complex to share it with the answer to a comment. Just to let you know that our NB-IoT seminar will stay in week 41 in Vienna. Please can you send me a proposal or some engineering services to make your IoT idea a cost-effective reality.